Me in the dress I stitched for prom in 1974, my senior year of high school. I went with a date that year. THERE WAS A TIME when prom was as simple as a bunch of girls and guys dressing up, dining in the school cafeteria and then dancing the night away under crepe paper streamers. No need to have a date, no flowers required, no professional photos, no getting your hair and nails done. No spending hundreds and hundreds of dollars for an evening of fun which, decades later, is mostly forgotten. I recall few details of my high school proms except the dresses I stitched from flocked gingham and dotted Swiss fabrics. If there was a grand march at the prom site, the Wanda American Legion, I don’t remember it and my parents were certainly not there to watch. My friends and I snapped pictures of each other with our Instamatic cameras. Many of us came with friends, not dates. Today’s proms, with expensive formals and flowers and photos and everything else, are nothing like those of 40 years ago. Today even asking someone to prom is a big deal. Take Faribault High School. Student organizers set up a Twitter account encouraging prom goers to submit their promposals. The entry with the most “favorites” won a prize at prom, which was held on Saturday. I amused myself scrolling through the creative prom invitations. Using Van shoes to arrows to cats, tennis balls, a watch, balloons, dinner out at a Japanese restaurant, bananas, Girl Scout cookies, a horse and more, these students asked each other to prom. The winner popped his promposal during previews to a movie. But if I was to choose the winner, I would have selected David, who penned lyrics to his girlfriend, Katie, to the tune of “Marry Me” by Jason Derulo. I don’t know the song. I don’t know the artist. But I do know that writing a song takes time and thought. And I have, as you would expect, an affinity for words. What are your thoughts on prom and promposals? Have they gone over the top, gotten too expensive, become too important? Or do you like how prom has evolved to what it is today? Over the top – that seems to be a common theme with many things these days. Search marriage proposals on youtube and see what some have done. The methods/approaches are often clever and entertaining. Some have spent a great deal of time and $ on them. Does this stem from most everything/idea having been done so many times over? Are people bored or no longer content with the status quo? I don’t know where the “I must upstage that which has been done before” mentality has spawned from, but I suspect it is a natural progression from keeping up with the Jones’s. Now we must upstage them! I still fall back on the old adage that less is more. Perhaps it is all a matter of how each individual feels like expending their resources. Perhaps it is a generational thing. As I have gotten older, I gravitate towards all things simple and easily sustainable. We have been a society of considerable excess and waste for a very long time. Happy Tuesday! Well summarized, Dan. What you’ve written here expresses how I feel also. And, yes, I think as we age, simplicity of living is a more common mindset. It’s like everything, Dan. I remember when you could just say, “Happy birthday”. Now you have to spend $3 on a card, buy an appropriate present. You then have wrap it, put it in a bag and stuff the bag with special paper. Prom is a special event. It is a mating a ritual which in many less primitive societies is highly stylized and lavishly expensive. Many of these rituals require the boys to test their courage and athletic abilities to attract a mate. I always liked the idea of making the boys sprint over glowing coals. Reviving the tradition could be beneficial. By holding the event toward the end of the evening, the teens are much more likely to remain sober. I know I can always count on you for a creative comment. You haven’t let me down yet. I like that– walking on hot coals. Have you seen the YouTube video where the man proposes and the woman accepts then jumps up and down and falls to her death? That poor man will regret his over the top proposal for the rest of his life. How tragic! No, I have not seen that video. And I am pretty certain that I don’t want to view it. That is horrible. agreed! I saw it on a local news website. They didn’t show all of the details but it was enough to get the point across. Ah, OK, glad they did not show the entire deadly event. No I haven’t; how sad. Prime example of keeping things simple. I’m with you on this, Missy. I don’t understand spending all of that money. There are ways to keep prom affordable by purchasing a second-hand dress, dining at home, taking your own photos, doing you own hair and nails, etc. I expect some do this and that’s good. I was thankful when none of my three kids went to prom. My eldest, and maybe the second one, attended the after prom party. No fancy attire needed there. I completely agree with Dan, and he said it very well. I am thankful I grew up in the era I did, and I am still of the mindset that less is more. I grew up with that thinking. It works for me. And I guess if this pomp and parade floats these kid’s boats and their parents don’t mind shelling out for the cost, then go for it. Another great post for pondering, Audrey! Yes, each family needs to make their own decision on prom based, I hope, on what they can afford and what they consider important. I’ve always lived by the “less is more” guide, too. I’ve never had more and I’m quite OK with that. I think about the monies and see dollar signs – sorry! I would rather spend the monies on a higher education, taking a trip of a lifetime, saving it, or buying a house. I love the creativity and the surprise of asking someone to prom. No need to apologize for your opinion, Renee. The thought of higher education expenses passed through my brain, too, as I was writing this post. This is, after alI, the “me” generation. 😀. I agree with everyone’s comments–and I love your article, Audrey! Thank you for stopping by with your comment, Cynthia. It’s always interesting to gather perspectives. I should research once where that word “prom” originated. “Formal” seems more fitting. It’s interesting to hear that you also have this event in Australia. Hasn’t almost everything gone over the top? My junior prom (didn’t go senior year) was held in the high school gym, which the junior class decorated ourselves with, yes, crepe paper, among other things. I think a disco ball was the only rented item. I’m sure kids today have fun at these fancy events, but I feel bad for those kids whose parents don’t have the extra money to spend or who just don’t want to spend it. Someone above mentioned birthdays — kids birthday parties are way beyond what they were when we were kids (at least in my childhood income level). I remember when my own kids were small and I learned about goodie bags/gifts for each guest. Ah well, times change and I try not to be a curmudgeon about it! Oh yes, you looked adorable! I agree. A lot of things seem to be over-the-top these days. That doesn’t mean, though, that we need to follow the leader. Gosh, those were the good ole days – back then we did things much simpler. Unfortunately during my senior year, my Dad was laid off from work and right after Christmas we moved and I had to change schools. Yes, that was a bad deal but I survived. I didn’t go to my senior prom but went to our senior “picnic/party” at Six Flags and had a lot of fun. That had to be very difficult, moving during your senior year. It has gotten out of hand as far as I’m concerned ( I sound like an old person) I recently was listening to a radio program on today’s Prom… did you know that the average cost of prom, including the “promposal” is $900.00. That kind of make me sick to my stomach! I’m so glad I lived in the days of “simple”. 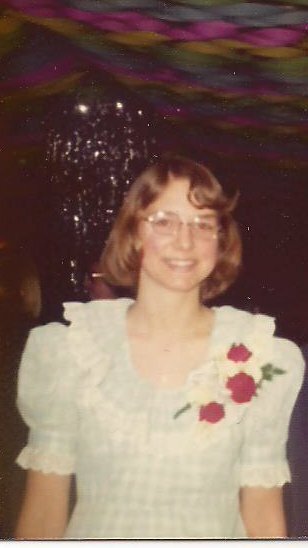 I went to two Prom’s… Ricks in 1977 and mine in 1979, I did my own hair, painted my own nails, and went to sales rack for my dresses. Jackie, I sound like an “old person,” too. But then I’m not exactly a “young person” anymore as I am way too close to sixty. Nine hundred dollars. I had no idea. Wow.